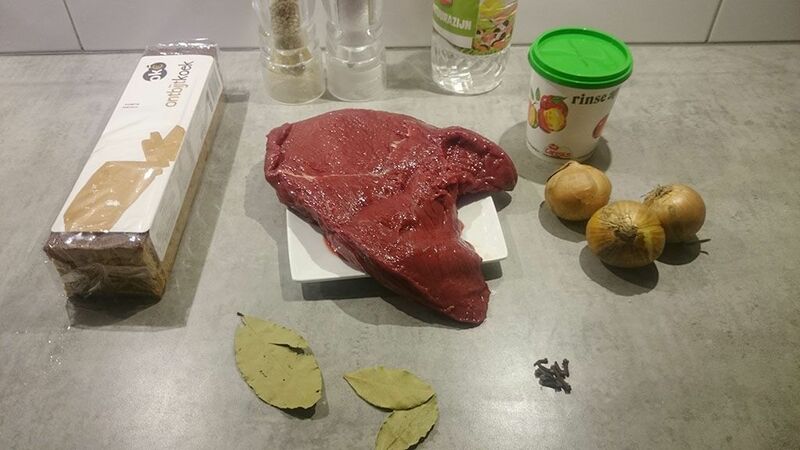 Celebrating our roots with a classic recipe of "Limburgs Zoervleisj" or Dutch sour meat. Updated for use in a slow cooker, recipe for four people. 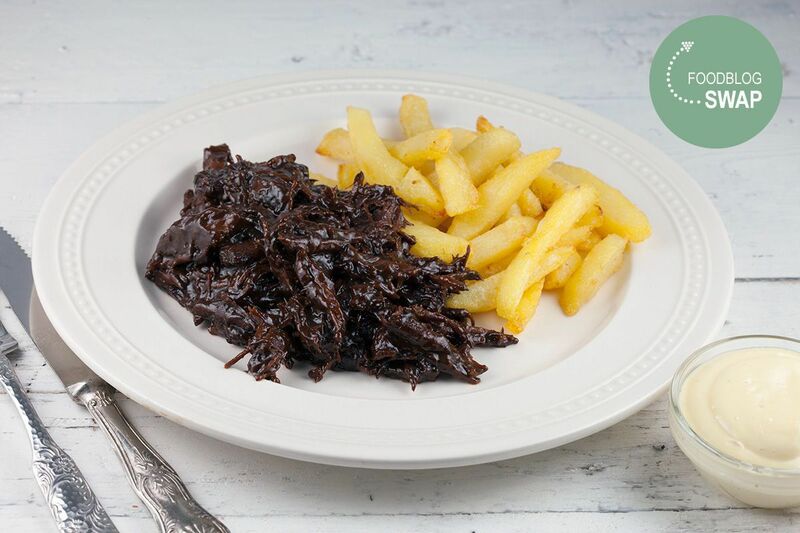 The traditional recipe asks for horse meat, substitute with beef if horse meat is unavailable. 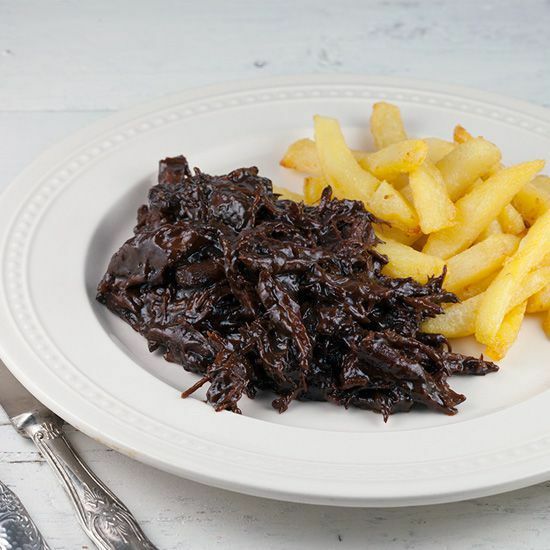 For this month’s food blog swap we’ve chosen a typically Dutch recipe: Limburgs zoervleisj. Veronique is from Limburg, and we moved back there a few years back. 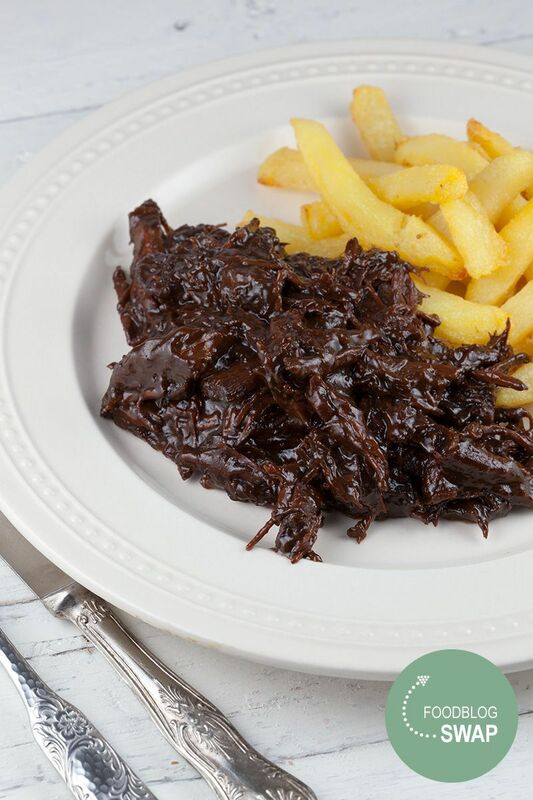 So we thought it would be a great idea to re-create the original version for Dutch sour meat, or Limburgs zoervleisj. Big thanks to Ans Vranken for this recipe, that has been passed down through the generations. Also big thanks to Sabine from cuisinevansabine.nl for inspiring us to make this dish! For this recipe we’ve bought a nice big piece of horse meat at one of the markets where we live. It’s cheap, tastes amazing and easy to work with. Swap the horse meat for (more expensive) beef if needed. Originally you would have to leave the meat in the vinegar for 1 whole day, but we’ve adapted the recipe for best use in a slow cooker ! CLEAN the horse meat, rid it of any veins, blood and clumps of fat. SLICE in big chunks using your chef’s knife and cutting board. Set aside. QUARTER 3 onions, it does not need to be cut finely, since we’re going to process it in a stew anyway. ADD 3 bay leaves and the cloves into a tea infuser. This prevents the herbs from disappearing into the dish, only to be found when eating. HEAT up a large (deep) skillet and brown the horse meat using butter or olive oil, whichever you prefer. Transfer the meat into the slow cooker when ready. Don’t throw out the left-over juices, quickly fry the roughly chopped onion quarters in the liquid and transfer into the slow cooker after a minute or 3. SQUEEZE in about half a liter of vinegar and enough water for the meat to be submerged. ADD the apple butter and SET your slow cooker timer for 10 hours on the lowest setting, and let the machine do its magic! After 10 hours of slow cooking, the meat should be very tender and well-cooked. TRANSFER the meat into a large deep skillet without the tea infuser containing the herbs. TURN up the heat to medium-high, add in 3-4 thick slices of torn Dutch gingerbread. STIR gently. SEASON with salt and pepper, add more white vinegar if needed. BRING to a simmer and wait for most of the moisture to be evaporated, until it looks like in the picture. Serve with a side of fries and/or salad. Enjoy!